SPEED COACHING with Ranya Renée! This is a video-based or live coaching program held in the setting of a group video conference meeting, with a group of supportive witnesses who are also receiving their own coaching. I cannot recommend this enough! I really enjoyed my speed coaching with Ranya Renee… she gives you detailed, insightful feedback with specific suggestions for how to improve. The ability to view a recording of the call is added bonus – you can pick up on additional info you missed the first time through 🙂 Give it a try! I so enjoyed the speed coaching pilot with Ranya and three other lovely dancers! The format is contained and to the point, so you get some good targeted feedback and things to work on, AND because you share the session with a small number of other dancers, you get to listen in on the tips and exercises recommended for them, too! Ranya provides concrete exercises and visualisations to help you target your weaknesses, and she has a great eye for the tiniest details of posture, weight and movement generation. Our session involved four quite different styles of dance and Ranya was able to provide detailed and practical feedback for all of us. I definitely recommend these sessions! If anyone is on the fence about signing up for coaching, you totally should! I signed up for the first session of speed coaching and it went really well. Ranya gave clear, concise feedback for a performance I had a few days later. Her feedback really gave me insight on what I needed to focus on fixing. The session went by fast enough that I could get other things done that evening, but long enough to get quality feedback. Being in a group allowed for me to also learn other techniques to improve my dancing. It was also really nice that she sent out a private link to a recording of the session so I could review things that I wasn’t able to take notes on. 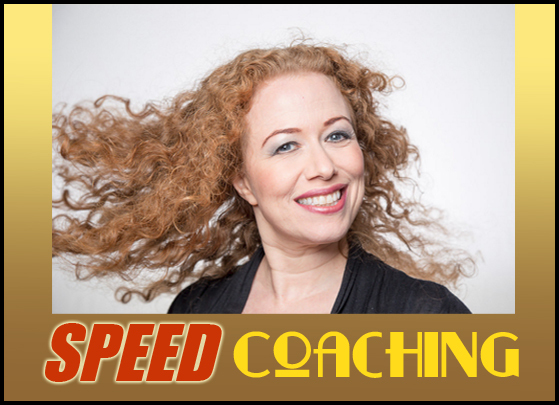 I highly recommend any coaching with Ranya, but the speed coaching is especially great for those short on time or want quick notes to improve. 1- Purchase the coaching for the session date and time you plan to attend. (Note: If you realize that you signed up for the wrong date or time, email office@ranya.net to alert us! No refunds available after payment has been made, but you can send another dancer in your place or just submit a video in advance of the live meeting, and Ranya can still give you feedback on your video, which you’ll be able to watch in the online replay, if you find you are unable to attend live. 4) Important: Let Ranya know if there is anything you would NOT be comfortable with her addressing in this group format. This information will not be shared with others. 3- You will receive an email invite from office@ranya.net to the coaching session about 15 minutes before the start time of the session. Please whitelist this email to be sure it doesn’t go to your junk or social folder. Follow the link provided and you can get online and say hello to others at that time. To save time, download the Zoom.us app for your device (computer, tablet or phone, but in general, the larger your screen is, the better, if you have a choice) in advance. You can also test your connection at the http://zoom.us website. Please join the meeting on time, but if someone needs to leave early, that is possible. You’ll surely want to stay till the end, but you can also watch the remainder on the replay. Spaces for these special test Speed Coaching sessions are limited to 5 or 7 people for each group meeting, so if purchase is not available for your desired time, it may be already full–email office@ranya.net to confirm this, or just sign up for another session. NOTE: These video sessions will be recorded. By participating, you are giving Ranya your consent to film your participation and to share that video with members of your own live session only, for a limited time, via a private link. Ranya will retain possession of the master recording and will make the online version viewable for 72 hours following the live session. Watching your session again allows you to learn even more from it, and to take notes that you might not have had time to take in the brief focus time of your session. In agreeing to participate in this Speed Coaching, you also agree not to share other dancers’ videos with anyone other than yourself, in respect of the privacy of group members.